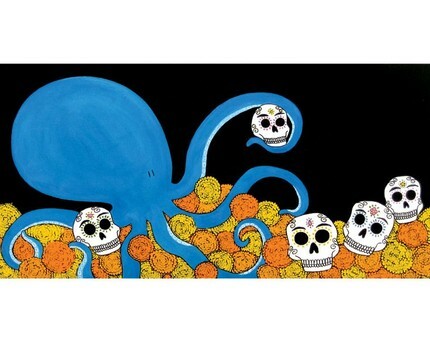 ionlylikemonsters: Dia de los Muertos Octopus! Dia de los Muertos Octopus! Halloween isn't the only event going on in the fall that inspires fabulous art, there is also (my favorite!) Dia de los Muertos. Now, there is quite a bit of awesome Dia de los Muertos art out there, but as you know, I like my holidays complete with octopus/squid/cthulhu types, so you can imagine my joy when I stumbled across this Dia de los Muertos octopus at PigDogOnline! It was such a happy accident that I found him, because it's not as though I would ever be optimistic enough to do a search for "octopus" and "Dia de los Muertos"! It does get me thinking though, do I dare search for Thanksgiving Squid or Christmas Octopus? I'm not sure I could bear the disappointment, now that PigDogOnline (and PnJPlushies!) have gotten my holiday cephalopod hopes up!